Welding is the process of fastening together two or more pieces of metal or thermoplastics using heat and pressure. Applying heat softens the material, allowing it to be affixed to another joint area. This technique first emerged in the middle ages but did not become the welding we know today until the end of the 19th century. Forge welding (the process of heating two objects and joining them by hammering them together) was replaced by electric and gas flame heating methods around the time of the Industrial Revolution. Welding is responsible for much of the infrastructure and equipment we have around us today, with many different processes existing depending on the requirements of the project. The form and thickness of the material is usually the biggest determiner of which welding process is the most suitable. Being introduced in the 1920’s, stick welding is one of the oldest welding processes still being used. Stick welding is cheaper than many other processes and can be used in mobile welding services, making it a popular option. Stick welding is often used to weld steel and stainless steel but is also applicable to other metals. However, molten splatter is a downside you have to be aware of with stick welding. Because of this, stick welding is more appropriate for jobs that don’t require neatness, such as quick construction jobs. Flux-cored welding emerged in the 1950’s, and is used for projects that require speed, thanks to the fact that it is an automatic process. This makes it ideal for use on construction sites, where it’s imperative to be able to quickly weld materials together. Gas Metal Arc Welding (GMAW) came about in the 1940’s, and is another automatic technique. The weld metal is automatically fed through a welding gun, which also emits a protective gas to act as a shield from the elements. GMAW is known to be a time-saving process, particularly good for projects that require a large quantity of welding work. Today, GMAW is heavily used in the car repair and manufacturing industries. Gas Tungsten-Arc Welding is known to be a very difficult and lengthy welding process, because of the high level of skill that is required. This is because there is only a small amount of space between the arc of the flame and the metal being welded. Although difficult, this method produces extremely strong products, meaning it is used heavily in the aircraft industry where durability is of paramount concern. Metal Inert Gas Welding (MIG) uses gas to shield the weld metal from natural elements like oxygen. This means the welder can keep working continuously, resulting in faster production. 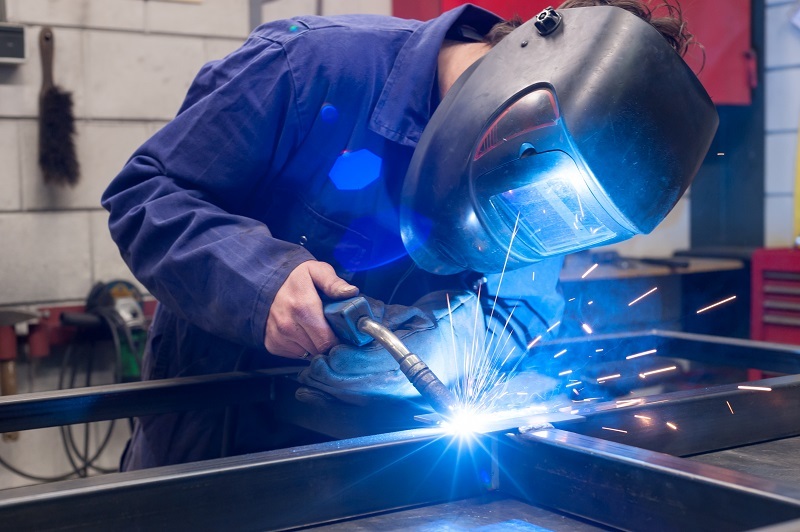 MIG welding is handy as it does not require a high level of skill from the welders, but it can only be used indoors, making it inappropriate to use on construction sites. Electroslag welding came about in the 1950’s and is known to be a fast welding process best suited for large materials. The electroslag weld is designed to weld vertical pieces without distortion and is best suited to large sheets that need to be assembled together. Plasma arc welding is similar to GTAW, as both methods work in the same way but use a different type of torch. The smaller arc means plasma welding requires even more concentration and skill. In this technique, an electrical current is sent through a tiny nozzle, which is surrounded by protective gases. This means an extremely accurate result when welding small areas. Again, the precision of this method makes it a popular option in the aircraft manufacturing industry. Sub arc welding is best used for high-iron materials like stainless steel. The device can be automatic or semiautomatic, making it one of the faster welding processes. However, bear in mind that the electrical arc must be covered by the flux, to protect the metal from the natural elements as well as provide protection to the welder. This makes sub arc welding one of the most effective welding processes, particularly for steel, as it is efficient and especially safe for the welder.